Swaying palms, white sands and sparkling waters: the 3 essential elements that attract 2 million visitors annually to Goa's balmy shores are plentiful in this tiny, glorious slice of India hugging the country's western coastline & bounded by Arabian Sea. There's far more to discover here than the exquisite pleasure of warm sand between your toes. The beautiful tropical Indian island of Goa attracts visitors from all over the world with its stunning beaches, ancient heritage and interesting attractions. There are no direct scheduled flights to Goa from the UK, however there are frequent direct domestic flights from Mumbai and Delhi. Charter flights are also available at certain times of the year. Many cities in this region still bear testament to the influence of the Portuguese who colonised the area in the early 16th century. Discover a wealth of history and culture as well as exploring the beautiful beaches, places of worship and world heritage sites. Naturists will also be keen to find cheap flights to Goa to enjoy the rich flora and fauna owing to its location on the Western Ghats range, popular for its hot springs which are regarded as having medicinal healing properties. Many visitors to India flock to Goa’s beautiful beaches to relax and explore some of what Goa has to offer and experience the true essence of this diverse culture. The Portuguese influence emanates through various aspects of the Goan lifestyle from the architecture to siesta time. Some of the most important colonial elements are in the construction of the many churches in the region such as the Basilica of Bom Jesus, the Se Cathedral which houses The Cross of Miracles and St Cajatan that is modelled on St. Peter's Basilica, Rome. Having a huge Christian community and history, most of the museums and other places of interest all revolve around their Christian roots. The cheapest flights to Goa, India are usually found if you book early and avoid travelling during the peak holiday seasons. Try our flight comparison search for the cheapest fares on low cost flights and lastminute flights. Goa features a tropical monsoon climate under the Koppen climate classification. 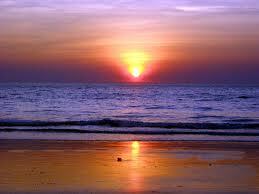 Goa, being in the tropical zone and near the Arabian Sea, has a hot and humid climate for most of the year. The month of May is the hottest, seeing day temperatures of over 35 °C (95 °F) coupled with high humidity. The monsoon rains arrive by early June and provide a much needed respite from the heat. 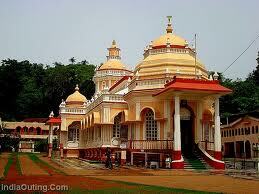 Most of Goa's annual rainfall is received through the monsoons which last till late September. Goa has a short winter season between mid-December and February. These months are marked by nights of around 21 °C (68 °F) and days of around 28 °C (84 °F) with moderate amounts of humidity. Further inland, due to altitudinal gradation, the nights are a few degrees cooler.